Enjoying asparagus is an acquired tasts, but one which offers many nutritional benefits. Did you know that this exotic vegetable when had fresh packs quite a healthy punch... Asparagus, a seasonal vegetable and available in three different colors white, purple and green, is a leafless member of the Lily family. The bud-like compact heads appears like a crown over the tall and slender stem with fleshy spears. 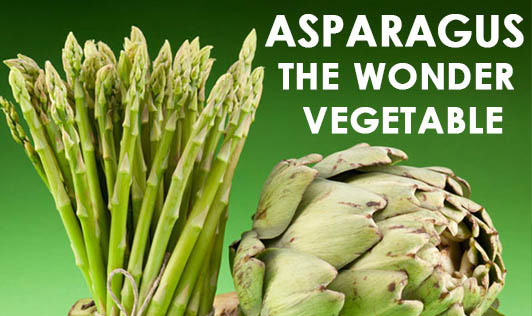 Asparagus is also very low in sodium and has calcium and magnesium in the ideal ratio of 2:1. The phyto-nutrients along with the highly dense nutritional profile of asparagus have a number of health benefits. • Alkaline nature: It helps cleanse the tissues and muscles of waste and is safe for patients with gout. • Anti-inflammatory agent: Helps relieve arthritis and rheumatism. • Cancer and cataract: Contains, anti-oxidant and glutathione that can help prevent cancer and cataract and progression of other eye problems. minerals in asparagus helps in the control of blood sugar but people with advanced kidney disease should avoid. • Heart Health: Folic acid or Folate (along with vitamins B6 and B12) is essential for maintaining a control on the Homocystiene level for cardiac health. One serving of asparagus supplies 66% of daily requirement. A daily intake of 400 mcg of folate reverses elevated homocysteine levels and thereby reducing number of heart attacks. • A Diuretic - Asparagus has very good amounts of potassium (288 mg per cup), quite low in sodium (19.8 mg per cup) and combined with good mineral profile especially magnesium has a diuretic effect. It has been found to be beneficial in the treatment of arthritis, rheumatism and PMS-related water retention. The unpleasant part is that for some people there is a distinct urinary odor after consuming asparagus. • Healthy Gut - A carbohydrate in it called Inulin promotes healthy micro flora in out gut (large intestine) similar to lactobacilli and bifid bacteria, but is not digestible by man. The collective activity of good bacteria acts as a good line of defense in our gut against disease bacteria. It prevents constipation by helping regular bowel movement. • Fights hangover: The amino acids and minerals found in asparagus extract may alleviate alcohol hangover and protect liver cells against toxins, according to a study in the Journal of Food Science, published by the Institute of Food Technologists.